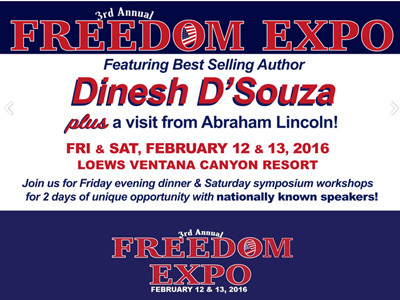 I'm going back to the 3rd annual FREEDOM EXPO in Tucson, Arizona. 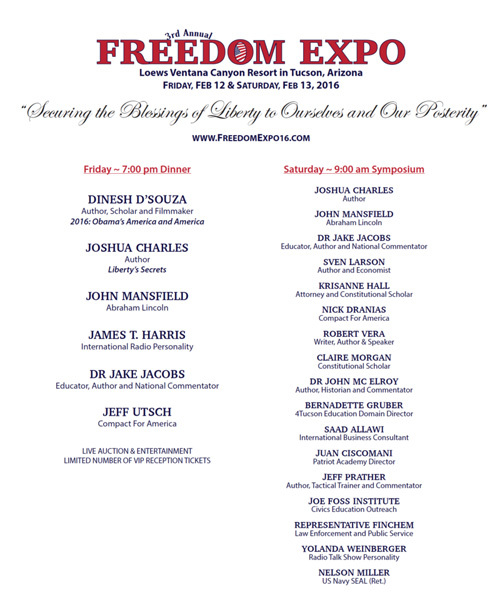 It was such an inspiration last year and seeing what the Freedom Expo Team has put together this year, I anticipate it will be The SUPER BOWL of Expo's across America. I mean come on, Dinesa D'Souza, KrisAnne Hall, Joshua Charles, James T Harris, Nick Dranias, Nelson Miller (US Navy Seal-Ret) & even Abraham Lincoln shows up on his 207th Birthday! WOW! I honored to be a part of such a Glorious Freedom & Liberty loving event, full of Patriotic people who love America and see her as an Exceptional Nation, unlike the Left in the Land. Hope to see you there!